Yes, my beloved painting of Rome by J.M.W. Turner has left me for a dude with money. 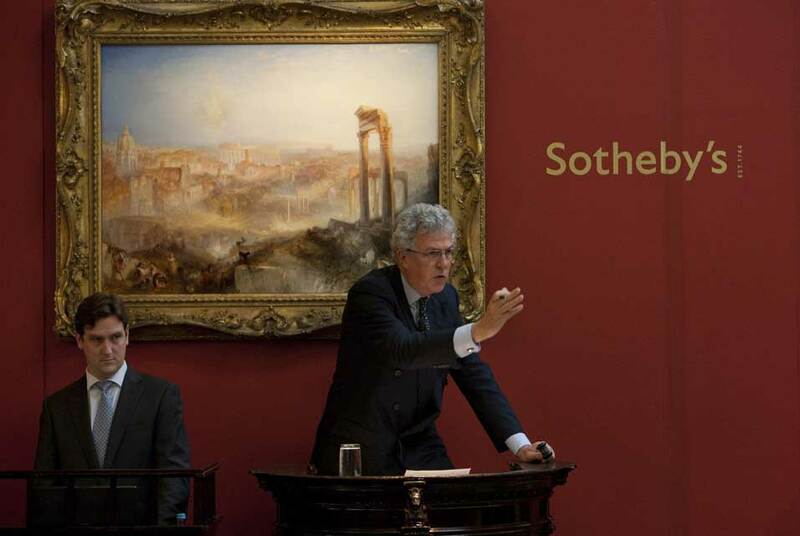 The J. Paul Getty Museum in Los Angeles opened wide its bottomless wallet today and snagged Modern Rome – Campo Vaccino from Sotheby’s in London for a record-breaking $45 million. The previous most expensive Turner ever was an 1841 painting of Venice called Giudecca, La Donna della Salute and San Giorgio which solds 4 years ago at Christie’s New York for $35.9 million. The pre-sale estimate was $18 million to $27 million, which was obviously on the low side given the extremely high quality of the piece and its excellent condition. It’s only been owned by 2 people, has been under the glass the whole 171 years since Turner added his last crosshatch, and is even in its original frame. Six bidders duked it out rough and hard. It only took 5 minutes for the price to reach $40 million (the extra $5 million goes in fees to Sotheby’s) and for all the other bidders to give up. The Getty is happy as a very rich clam, needless to say. They didn’t even reach the limit of their budget, so from their perspective it’s a steal. It’s also a major boon to the city of Los Angeles, because this painting will make it the American city with the third largest number of Turners after New Haven (on account of Yale) and Washington, D.C. (on account of the National Gallery). They shouldn’t count their Turners before they hatch, however. By UK law, any significant piece of art that has been on British soil for more than 50 years needs a license to be sold and exported. If a British organization of museum can come up with a sum equal to the sale price, the license is not issued, the fureigners get their money back and the locals get to keep the art. The Getty has some painful memories on that score. The Getty knows the drill: In 2002, it tried to buy Raphael’s “Madonna of the Pinks” from the Duke of Northumberland. The sale was a no-go: The National Gallery in London got the painting instead after coming up with $46.6 million over the ensuing two years to buy the painting in the Getty’s stead. That doesn’t seem likely to happen again, though. The big budget UK museums have Turners so they probably won’t attempt to scare up such a huge sum for the Campo Vaccino.